Brexit minister David Davis warned on Thursday that parliament could veto any final deal negotiated with the European Union unless it has a "substantive" idea of what the future trading relationship will look like. Britain's parliament will vote on a formal withdrawal treaty later in the year — covering issues such as the divorce bill and citizens' rights - in a potential flashpoint in the Brexit process. 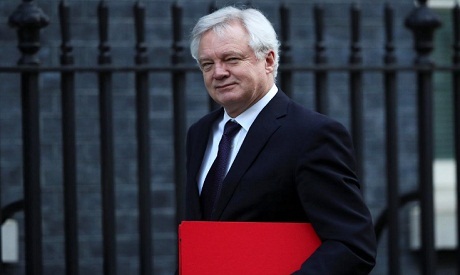 Davis said Members of Parliament would insist on "a lot of detail" before signing off on any deal because Britain will have to make a payment of about 39 billion pounds ($55 billion) to the EU to honour its financial obligations to the trade bloc. "The withdrawal agreement is payments of up to 39 billion pounds, it's a lot of money, and parliament is unlikely to sign off on it unless we can be pretty substantive about what is going to be there in the long run," Davis said at a Wall Street Journal event in London. Britain's vast financial services industry will emerge largely unscathed from Brexit and the sector will suffer far fewer job losses than first feared, Davis said. "There is not going to be a mass migration, the critical mass is still going to be here," he said. "The reason that the City is the biggest and most successful financial centre in the world ... is not just Europe, it's about the mass of skills, the business environment here, it's about the reliability of tax law."